In Japan, very small automobiles traditionally were meant for families seeking a low-cost form of transportation. 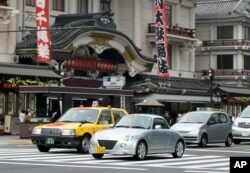 But these minicars, also known as kei-cars, have instead become popular with another group of drivers: older adults. Honda’s N-Box model car, for example, is very small. The car is equipped with technology designed to make it safe and easy to drive. The N-Box has been marketed mainly to young families. But Honda has found that about half of its owners are 50 years of age or older. Carmakers have hoped that by adding high-technology equipment, young people could be persuaded to buy minicars. Yet the number of Japanese drivers under age 30 has fallen by nearly 40 percent since 2001. Minicars are not costly. Prices start at about $7,500, and ownership taxes are low. For those reasons, the cars have gained a loyal following among Japan’s growing number of elderly. Many of them very often earn about the same amount of money from one year to the next. One out of every three passenger cars sold in Japan is a minicar. Tortoise, an auto dealership south of Tokyo, specializes in minicars. Seventy percent of its buyers are older adults. “After their children are grown and leave home, more people are looking to downsize from larger family cars to more compact ones,” noted Kiminori Murano, a managing director at Tortoise. All of Japan’s major carmakers sell low cost, fuel-efficient cars. These vehicles are produced mainly for Japanese buyers. With very small engines, they are considered too small for foreign markets. Some industry experts are predicting that automated cars, taxis and buses will keep older people active later in life. But until those high-tech products become a reality, kei-cars are likely to continue to be popular in Japan, a country with an aging population. The Reuters news agency recently spoke with Hideaki Takaishi, a safety engineer at Honda. He said that one safety device uses sensors to observe a vehicle’s surroundings and identify whether the driver has pressed the wrong pedal. Carmakers also are trying to develop artificial intelligence systems that can advise drivers. Japanese minicars have long been popular in Japan. Now older drivers have become a loyal following. Such advice could include warnings about safety risks, such as if the vehicle is moving toward the side of the road. Takaishi said systems like this will help older drivers. “They really want to maintain their independence while they’re driving, and it’s a skill they’ve honed over many years,” he said. In Japan, the number of people aged 60 and older with a driver’s permit is growing faster than in other developed countries. In many rural areas, some people are driving into their 80s and 90s. This has led to increased traffic accidents for older drivers, although the total number of accidents is decreasing. Last year, the elderly were involved in 55 percent of Japan’s traffic accidents. To deal with the problem, Japan’s Ministry of Economy, Trade and Industry launched a program to support safety technologies. The program provides a logo that manufacturers can use to identify cars with the new safety aids. People buying such cars can save on accident insurance. The safety technology may only increase the popularity of Japan’s Kei-cars. Mario Ritter adapted this Reuters' story for VOA Learning English. George Grow was the editor.